For Alisa Cavanaugh, her connection to needle arts has been somewhat of a family affair. After learning crafting skills from her grandmother when she was younger, Alisa continued that legacy and passed those skills onto her own children. Teaching her kids how to tap into their creativity is something that Alisa values a lot and finds super important in any kid’s life. “Kids don’t always have the opportunity to express themselves, but at The Handwork Studio, a child can learn something no matter their age, and walk away with something that they created ton their own. I think every kid needs some sort of outlet to be creative,” said Alisa, and it has definitely been a creative outlet that has struck a chord with her eleven-year-old daughter and nine-year-old son. Both of Alisa’s children have really connected with The Handwork Studio, but their journey and passion with needle arts is very different from one another. Alisa’s son has more of an eye for detail and does not mind the kind of patience it takes to complete some projects. He has really loved to do embroidery because of the time and skill it takes to complete this. Alisa has also recently taught him how to corner to corner knit, and he will often stitch alongside her. This image really reflects the moments Alisa shared with her grandmother, who taught her how to cross stitch. “I ended up spending some time with my grandparent when I was young, and I remember sitting with her on her sun porch and just stitching with her. Her walking me through it and explaining the counting. I liked that it was kind of like a puzzle.” Even though her son may not be able to complete as many stitches as her, he loves figuring it all out with her. Her daughter on the other hand, will have a project in mind and want to complete it right on the spot. Alisa said she really likes machine sewing, but sometimes has trouble with the amount of time that goes along with it. A few weeks ago, at sew tech, she was super excited to make an otter from all of the kinetic threads involved. Even though the project took some time, Alisa said that seeing each step be completed and having an end goal within each day helped her feel motivated and excited about coming back to the same project day after day. Alisa’s daughter ended up being super proud of that and loved all of the conductive pieces that allowed her to really see her progress. Alisa says both of her kids, however, love to do these things because it allows them to be creative. 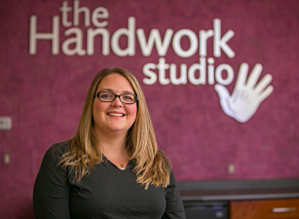 Before becoming a Program Manager at the Narberth Studio, Alisa worked just down the street from the Studio. When she discovered the program, she thought about how great of an idea it was. She loved the idea that kids who were not learning these types of skills could have the opportunity to see what they could accomplish and what they could gain from learning needle arts. When asking about her own connection to The Handwork Studio, and the impact she thinks it has on kids today, Alisa said, “It’s a great place because I enjoy what they do. It’s a great opportunity for kids to learn something a little different, and you know? It’s something my kids enjoy too!” So after sending her own kids to the camp during a winter workshop, Alisa let her career lead her back to the program her children loved so much. “It's always been about a gift of love for me,” said Alisa. Creativity and this love of creating things through handwork is something that lies very close to home for her. After learning how to cross stitch and do other arts and crafts from her grandmother and aunt, Alisa loves being able to find a way to pass these kinds of skills onto her own children and all of the children who discover The Handwork Studio. __________________________________________________________________________Click here for a look at our summer sewing camp options for your child. Also, be sure to check out our store and our new partnership with Simplicity Sewing Patterns!